When I had almost completed my self portrait, I didn’t just want to leave it is a pencil sketch. 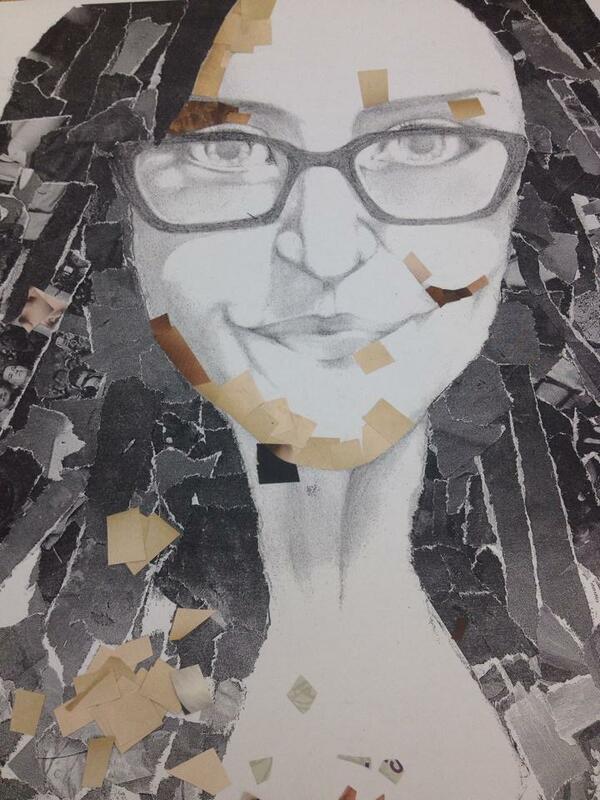 I was just starting to shade in the parts of my hair when I thought about trying collage. I was inspired mostly by the Artist Jonathon Yeo who’s work is mainly made from collage and paint and he primarily focuses his attention on portraiture. 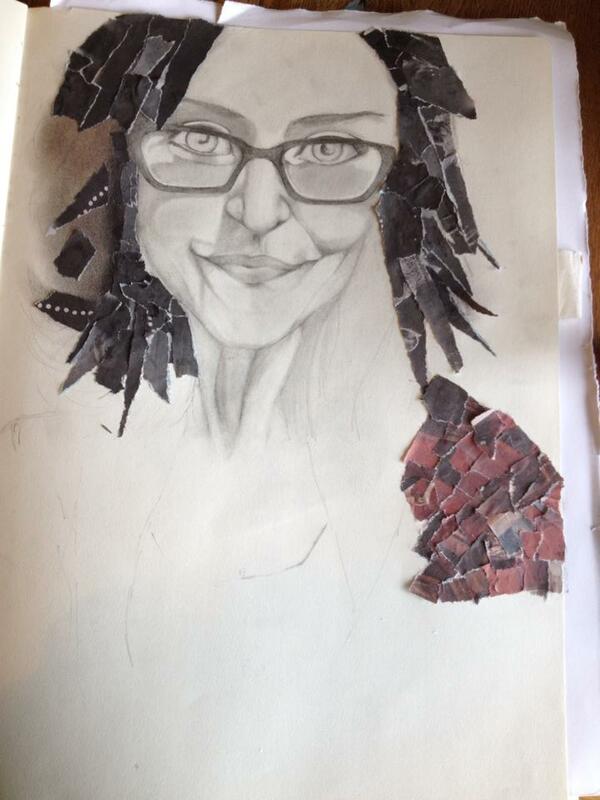 I thought the contrast between the fine detail of the portrait of my face and the collage which can give a rather rough finish would look really interesting together. 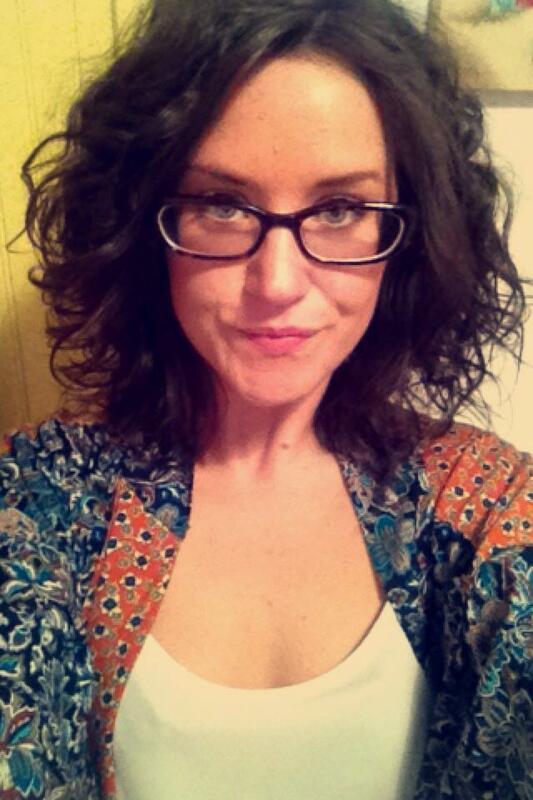 I started with my hair which does look particularly dark in the photo which I drew from. So I used very dark colours and black to achieve this. 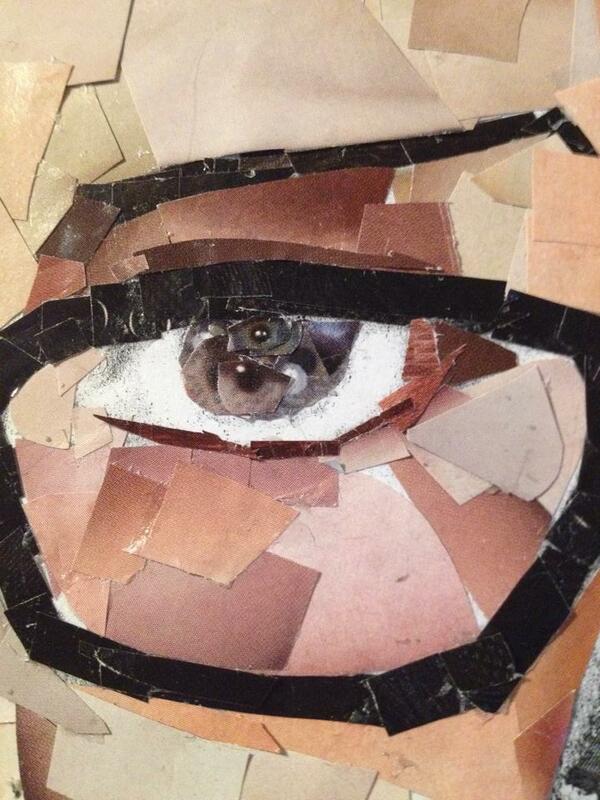 I used news papers and magazines and I wasn’t particularly neat when I tore off pieces to use. I didn’t want it to look too neat because I think that collage can look more effective when it is not too tidy. And with it supposed to being my hair I thought this was the best way to achieve that look. I started on the colours of my cardigan in the middle of doing the dark of my hair so that it was too much of a tedious exercise. And in fact it was quite enjoyable and therapeutic and not boring at all. I didnt mind that the colours didnt match exactly, but you can see from looking at both the photo and the collage they match enough that the viewer knows what the colours represent. I also carried on working into the sketch of my face as I went to try and improve it as much as I could and create the likeness as much as I could. I am really pleased with the outcome and really enjoyed using collage as the main medium for this particular piece of work. It was not planned out at all but I think that it has worked out really well. 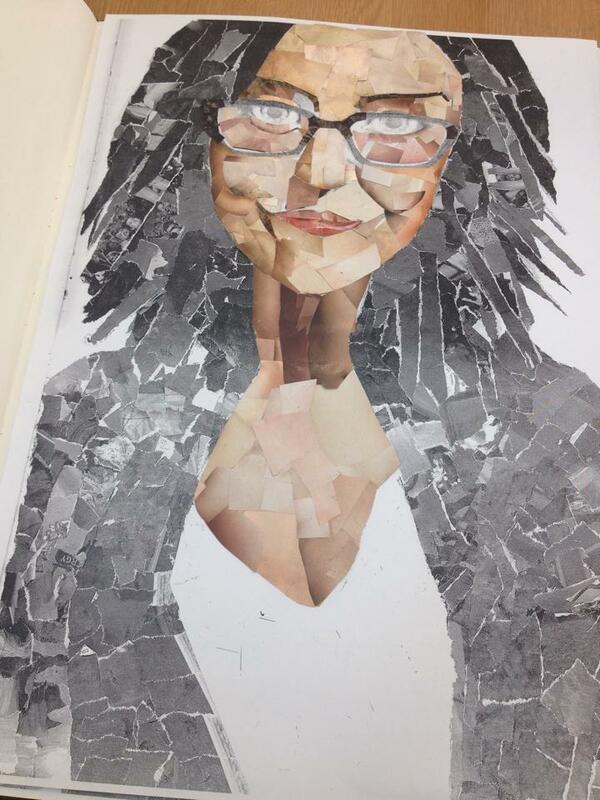 Richard Cross was really impressed with my collage work and suggest I try something else. 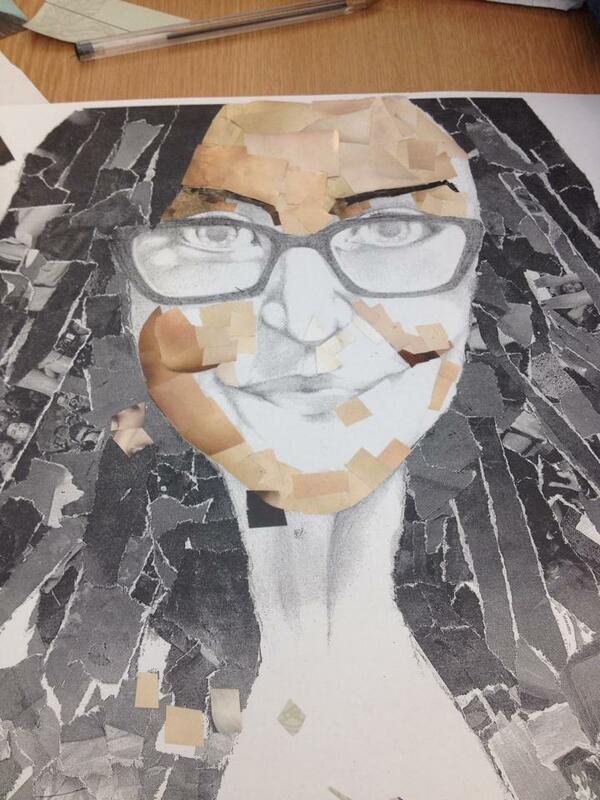 So he photocopied what I had already done and suggested that this time i work into my face using collage. I really liked this idea and because I had enjoyed doing the collage I was looking forward to doing this even though I knew it would be quite challenging. 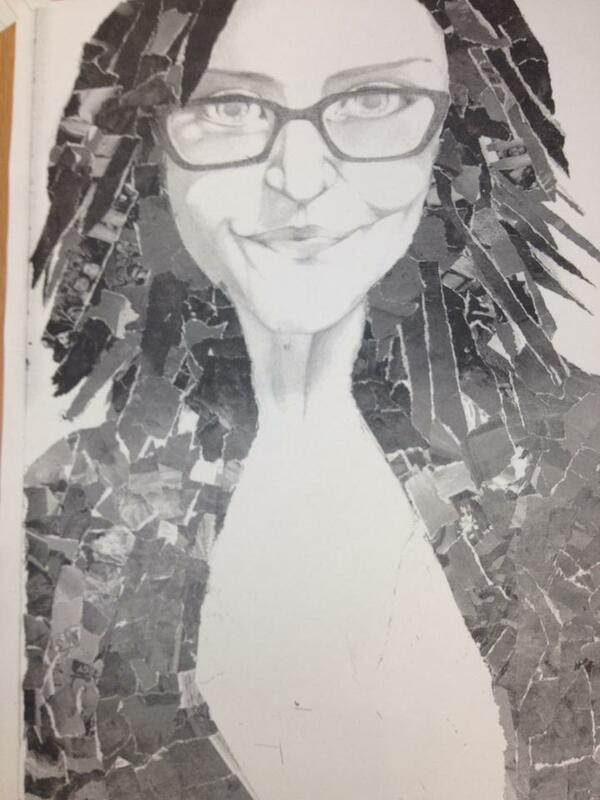 This was the photocopy of the collage with the sketch of my face before I had got to work on continuing with the collage. Because this was a much more intricate task I was careful about the colours I used and I decided that instead of tearing the pieces I would cut them using scissors into more manageable pieces. 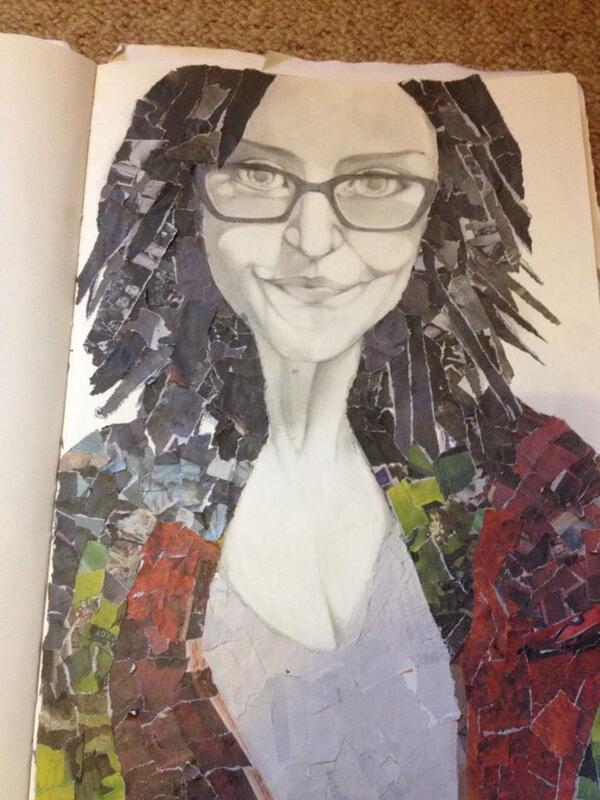 I used hair magazines as it was mainly faces on the pages and it was easier to match the skin tones that I needed. I started on the outside first and focused on the darker and shaded areas of my skin first. 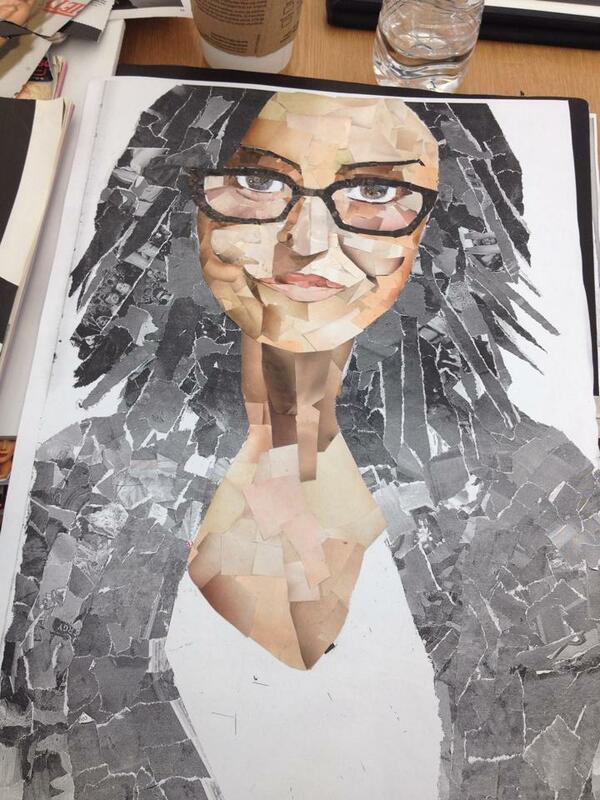 ALso by using scissors and not just tearing pieces I was able to get the shapes I need for the definition in the face. It was fiddly work, especially the areas like eyebrows and the eyes. I found the mouth very hard to do as I needed very small pieces for right in the corners. And I really did want it as accurate as possible as the detail would be so much better and look more like the photo. To make the image resemble the photo even more so, I made sure the colours used to do my face were actually from the same area of the face from the magazines. So the skin tones are from the faces in the magazines, my pupils are actually different colours of blue and green pupils from the faces in the magazines to match more accurately to mine. My lips are made up of lips from the magazines models and so on. This way it would look more realistic and I was able to get more accurate colours that ake up the different parts of my face. Here are some close up so it is more clear as to how the colours I used made up the overall effect of using the collage. 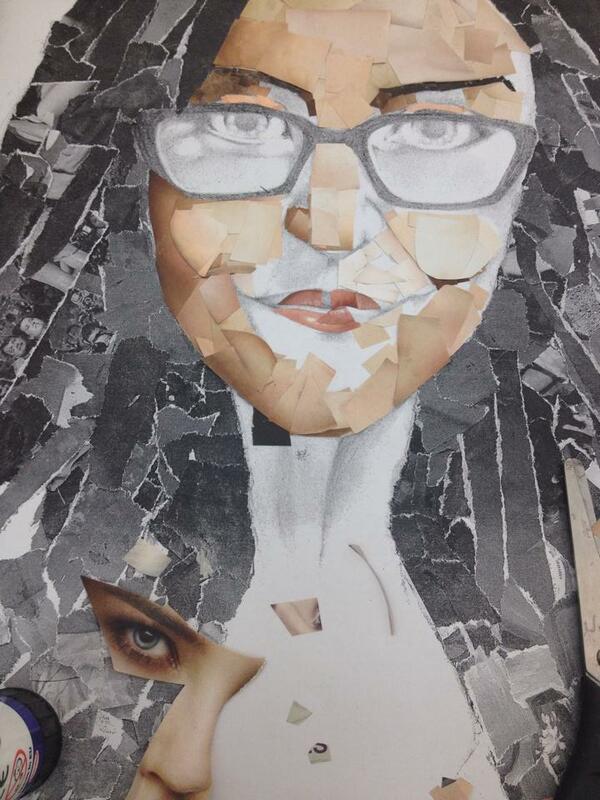 This is my portrait finished in collage. I think it looks really effective against the black and white background of the other part of the collage. 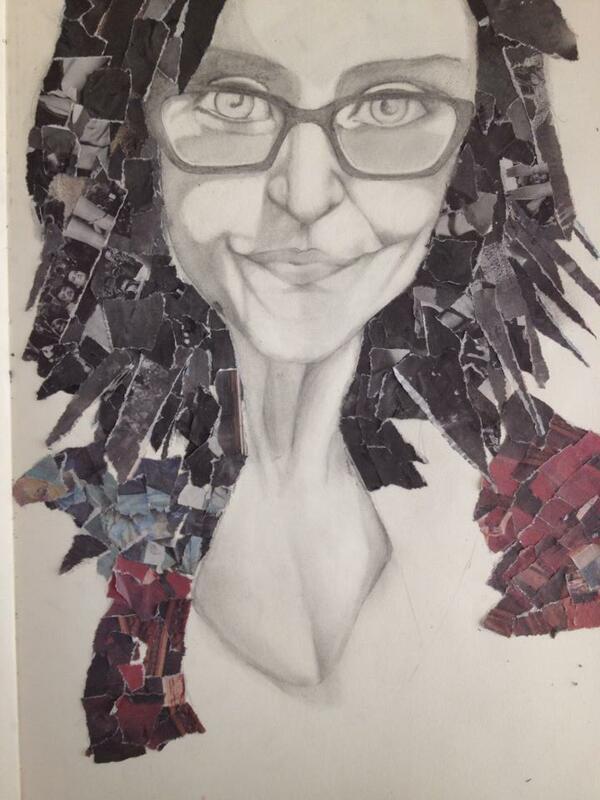 This way I can also keep my self portrait as it is whilst using other forms of medium to progress and improve skills and develop new ones. Working over the top of an existing image helped immensely. 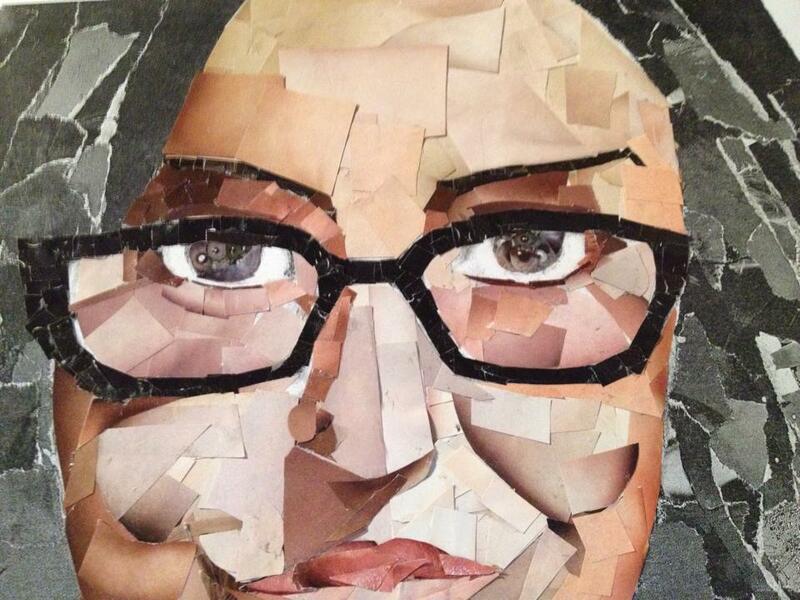 I feel if I had tried straight away to do a collage of my face from scratch the result would not have been as effective and realistic as this one. I will continue to use collage and hopefully improve using this technique. Initially I thought collage would be tedious and repetitive work but surprisingly it is an enjoyable task and the end result is worth the time consuming work that comes with it.